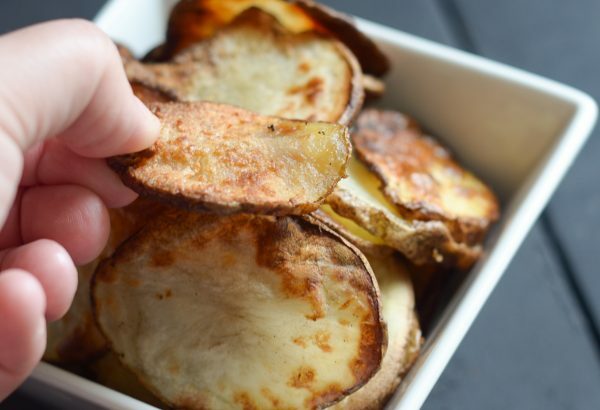 Get ready for a tasty treat with Air Fryer Potato Chips! 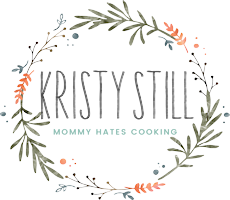 If you’ve been following for long, then you know that I LOVE my Air Fryer. I mean, I really love it. I’ve used it so much that I could honestly use a new one. I’ve nearly worn this one out. Have you picked out an air fryer yet? 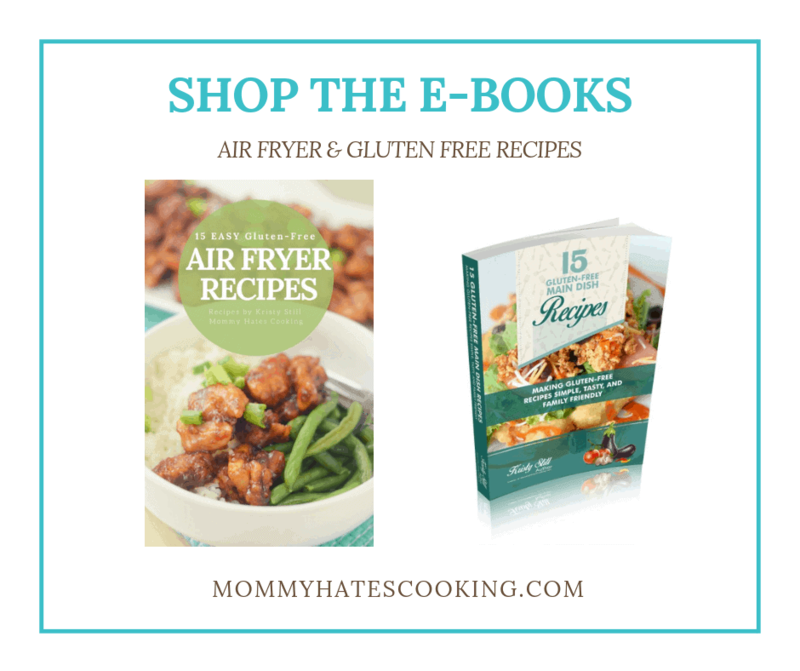 If not, be sure to check out this post on How to Choose the Right Air Fryer. After I made these onion rings and zucchini in the air fryer, I decided it was time for some homemade air fryer potato chips. These are super simple because you really don’t need much, plus it’s very low oil. 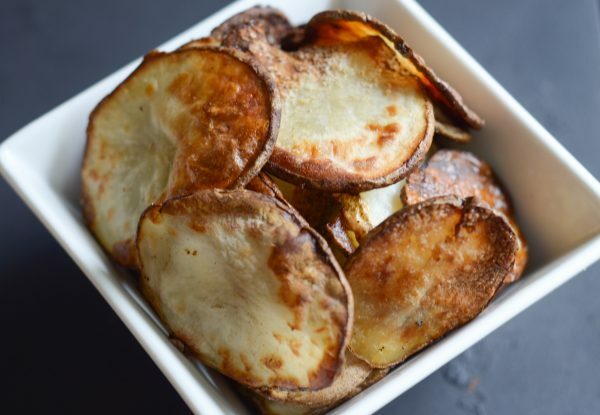 What do you need for Air Fryer Potato Chips? That’s it, just 3 ingredients. Now the big thing is what oil should you use? Let’s talk about this! 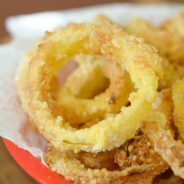 What is the best oil spray for the Air Fryer? I’ll be honest, generally, I tend to lean toward Olive Oil Spray; however, it’s actually best to use a high heat oil. The best thing to do is keep in mind the smoke point of the oil, for instance if you are using an Olive Oil Spray, then smoke point is usually about 330 degrees. 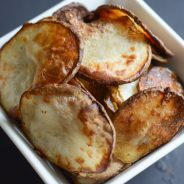 These air fryer potato chips are going to be going at about 400 degrees, so an oil spray such as Grapeseed, Avocado, or Coconut, would actually be a better option. I’ve linked to all of the information on those, so you can see the smoke point. In full disclosure, I work with Pompeian; however, this isn’t a sponsored post. 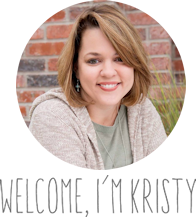 They have a lot of great information on the smoke point on their website. 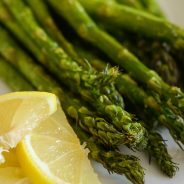 I actually love the taste of the Olive Oil Spray, but it won’t be as great when the chips are burnt, that’s why you want to be sure to choose an oil spray with a high smoke point. That leads me to say that I would go with a spray, that way you get a light spray of oil not a coating. 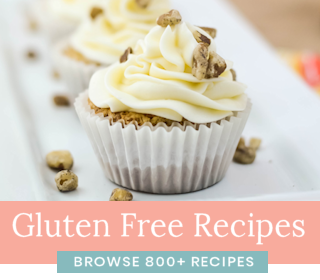 The whole idea with the air fryer is less calories, so keep that in mind. 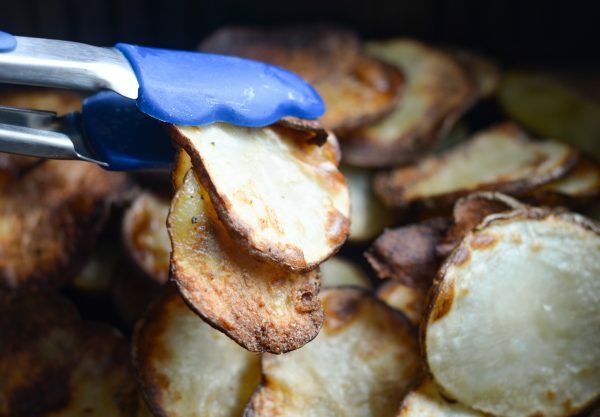 Can you add different flavors to Air Fryer Potato Chips? YES! 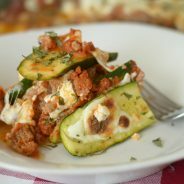 It’s a fine idea to get creative, if you prefer you can do salt and rosemary, ranch seasoning, italian seasoning, barbecue seasoning. 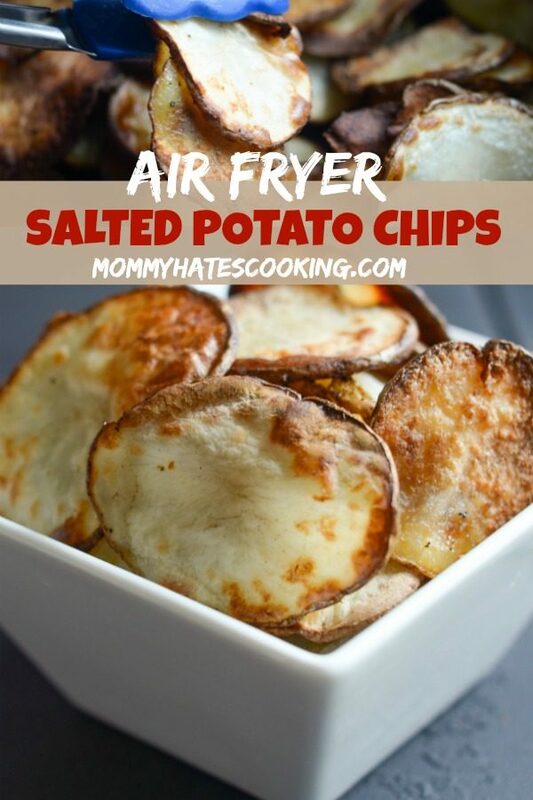 It’s a great way to get creative with these Air Fryer Potato Chips and go with what you prefer. We like to pair ours with burgers, I love sharing homemade potato chips with family and friends. It just seems like it pulls the whole dinner together. Of course, they also make for a great snack. 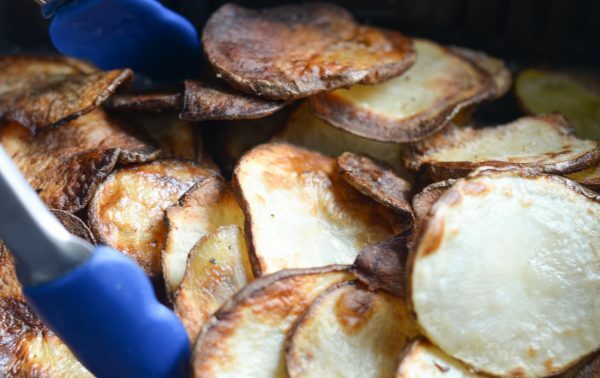 Let’s get on to making these Air Fryer Potato Chips! 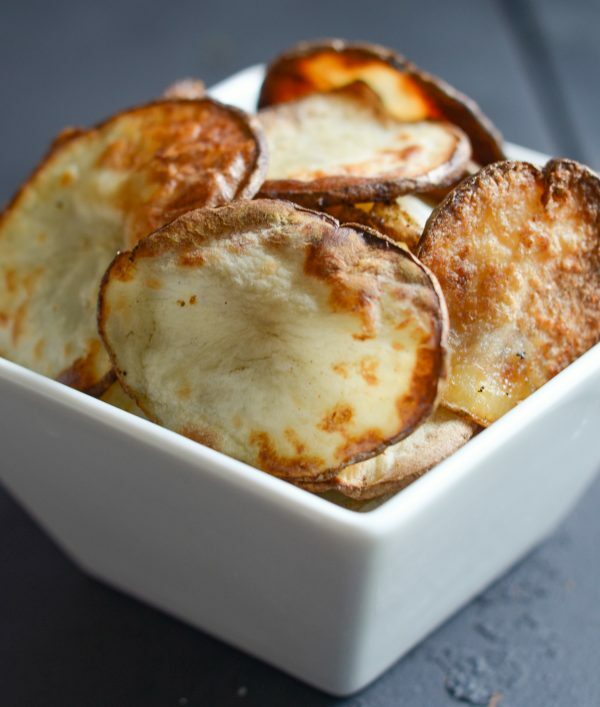 If you don’t have an Air Fryer, check out these Baked Potato Chips! Begin by washing and slicing the potatoes. This needs to be very thin slices about 1/8 inch thick. Use a paper towel to soak up any excess water from the slices. Place the slices in and even layer in air fryer basket, coat with spray, and a sprinkle of salt. Cook for about 15 minutes at 400 degrees. Rotate the potato chips and cook for an additional 15 minutes at 400 degrees. Repeat this process for the remaining potato slices. Be sure to check in our them about 1/2 way through the cook time as all air fryers can sometimes heat differently. Also, this may need to be repeated a few times to finish up the potatoes depending on the size of your air fryer. I have the ninja as well. Do you put directly in or on the wire basket or the other plate? I use the basket for these.